Royal Carpet & Duct Cleaning is equipped with 25 years of combined experience and provides people in Milton with professional and affordable steam cleaning services. Our high-quality carpet cleaning services get rid of stains and dirt to revive your interiors. 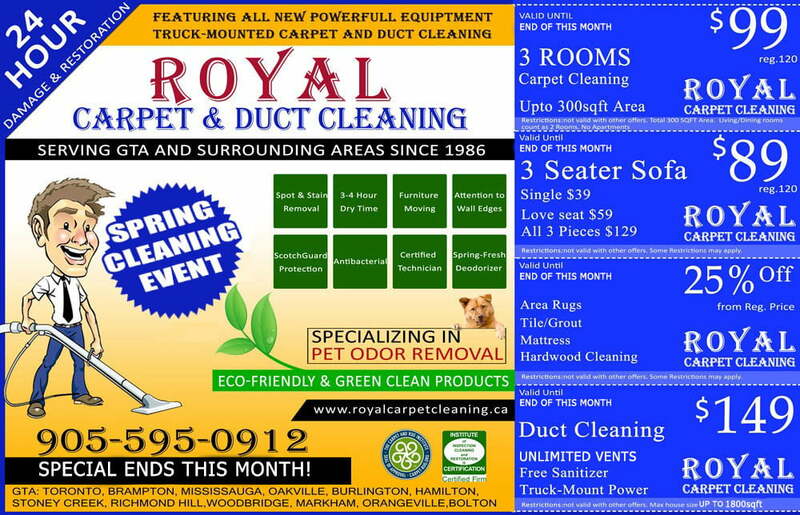 Listed below are numerous services Royal Carpet & Duct Cleaning offers in Milton at highly affordable prices. Our experts believe that whether your area rug was purchased at a reasonable price from a wholesale rug distributor or at an expensive price from overseas, getting it cleaned should be affordable. We professionally clean your area rug and help maintain its elegant appeal. Carpets collect tons of dirt and dust over the years. Royal Carpet & Duct Cleaning services in Milton use a detailed cleaning regime of your residential and commercial carpets to get rid of all the dirt trapped into their fibres. The cleansing prolongs the life of the carpet and gives it a fresh new beginning at an affordable and competitive price. The drapery in your home filters the air that circulates in the home or comes in through the window, collecting loads of dust, dirt, and bacteria that cannot be removed through vacuuming. Experts at Royal Carpet & Duct Cleaning are equipped with a well-devised process and sturdy equipment to completely extract all the harmful dirt in your drapes. We pre-examine and test the fabric before beginning the cleaning process. Our trained technicians also disinfect the fabric. The quality of the air you breathe is crucial to your well-being. Impure air can cause allergies and other health problems, such as breathing problems, headaches, sinus attacks and irregular sleep. Our duct cleaners utilize high-quality equipment to extract all the micro-pollutants and ensure that the air you breathe is entirely clean and fresh. The air conditioner also has to work harder to maintain appropriate temperatures in your house if they have to push air through ducts blocked with dirt. We recommend you to get your duct cleaned every three to five years. Simply washing your bed sheets do not get rid of bacteria, dust mites, bed bugs, allergens and other harmful bacteria. We will professionally steam clean and sanitize your mattress to make them good as new. The experts at Royal Carpet & Duct Cleaning are at your service for both big and small jobs. If a small accident has caused your carpet, area rug or upholstery to stain and spot, you can rely on us to be on location after you call us to fight the problem, using our non-toxic and safe-to-use cleaning products. We will disinfect and remove any odour from the affected area while making sure the colours and design of the fabric do not fade. Royal Carpet & Duct Cleaning also specializes in tile and grout cleaning. We will remove all the dirt build-up from your home, making the floors look clean and extending the life of your tiles. Furniture upholstery begins to dull over time due to grime, dirt, and stains. Furniture upholstery cleaning is a cost-effective way to revive your furniture. Cleaning up after a water and sewage flooding at commercial and residential properties is difficult. The Royal Carpet & Duct Cleaning staff is on-call 24 hours a day and 7 days to a week to assist you in the event of such damages. 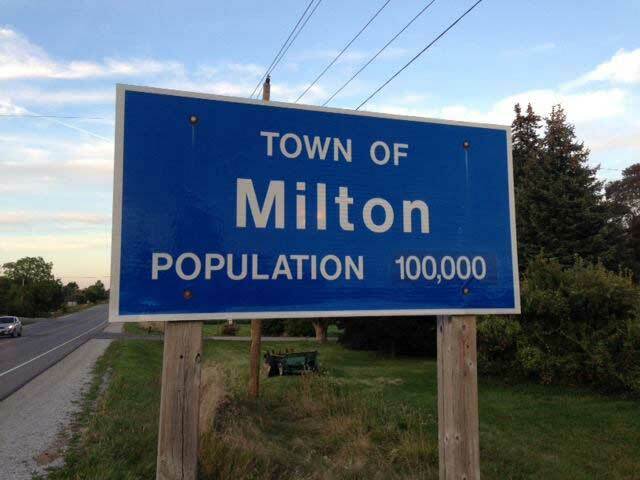 Royal Carpet & Duct Cleaning experts are heavily trained and equipped to serve all your cleaning needs in Milton. Visit royalcarpetcleaning.ca to read about all our services in greater detail. You may call to speak with us at 1-855-438-7692. The emergency line for all your water damage services is 905-595-0912.